When I first started in Aikido weapons held no fascination for me at all. I never watched Samurai movies. I was not fascinated by Ninjas. OK, so yeah, I had a throwing star years ago, but that’s about as far as it went. I wasn’t planning on training with weapons at all, in fact. And then one time I had my days mixed up, and ended up in a weapons class by accident. And I loved it. Go figure. Weapons training can help us understand open-hand techniques better, and helps develop better alignment and grounding. At our dojo we can start training in weapons right away. The classes are not reserved for advanced students. In fact one student recently did the weapons class as his very first-ever Aikido class, and he did fine. Most dojo have some school weapons, that anyone may use. If you aren’t sure which are OK, ask. At Aikido of San Diego these are marked “ASD” on the end. The rest of the weapons belong to other students. At another local dojo there are separate racks for “public” and “private” weapons. In general, don’t mess with other people’s weapons. Another student will be happy to help you pick one out if you aren’t sure what to do. 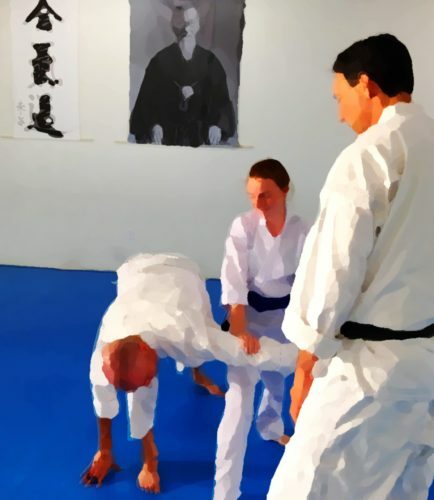 What I have seen people do most often is a standing bow toward the shomen, holding the weapon horizontally in front of them, when they step onto the mat, and when they step off the mat after class. At your dojo people may do seated bows. Keep your eyes open and follow the example of the senior students. Be very aware of what’s going on around you whenever anyone is training with weapons, and watch out behind you when you are training. It’s easy to hit the wall when you raise a weapon to strike. Watch out behind and around other people when you are on the mat! We aren’t used to people doing things behind themselves, or out to the side, but if you walk behind someone as they are coming around for a strike you could get clobbered. Notice where others place their weapons before and after bowing in (to their left or right), and how other students hand weapons back and forth with their partners (horizontally? vertically? with a bow?) and follow their example. I recently went to a weapons seminar where nearly everything was done the opposite of what I’m used to doing. When in Rome, and all that! Control your weapon during training. Don’t throw or drop it by accident! It should probably go without saying, but… No horseplay. Or Ninja/Samurai play, either. Be respectful and safe. These are real weapons and they can cause real damage. It’s OK to rest the end of your jo on the mat, but never use a jo or bokken to help you get up off the mat, and never lean on it for support. This puts permanent dents in the mat – especially with bokken that have a pointy end. Golfers won’t need to be told this. They know better than to use a club when getting up from the ground. Same idea, except in golf it’s the club that would be damaged. In Aikido it would be the mat. Never hit or touch someone with a weapon, even gently, when practicing. It’s rude. Always stop short of touching them. Stepping on or tripping over a weapon on the mat is an easy way to get injured. When we aren’t using our weapons for a few minutes during class (such as when only one partner needs to have a weapon), we put them down right up against the wall. Be alert to any local oddities, regardless of what you might have read or heard of as being “the correct way” of doing things. Some dojo have interesting little customs of their own. For instance, even though it’s not “normal weapons etiquette” to do this, when we are sitting and watching the instructor demonstrate a technique we often tuck our weapons around behind us, against the wall if there is in any danger that someone might step on them. See? That’s not so bad. Pay attention, train safely, and have fun!